Wellbeing Guru is a refreshing and unique approach to engage employees and individuals in health and wellbeing; with thousands of quiz questions, facts and information around health and wellbeing topics! Easy to use, informative and generates wellbeing engagement, fun and conversation. Perfect for rest rooms, kitchens and areas with a high footfall for individuals to interact and engage in wellbeing questions, factoids and thought provoking quotes of the day – generating discussion around health and wellbeing. Outcome: Wellbeing engagement, boosts morale and productivity. 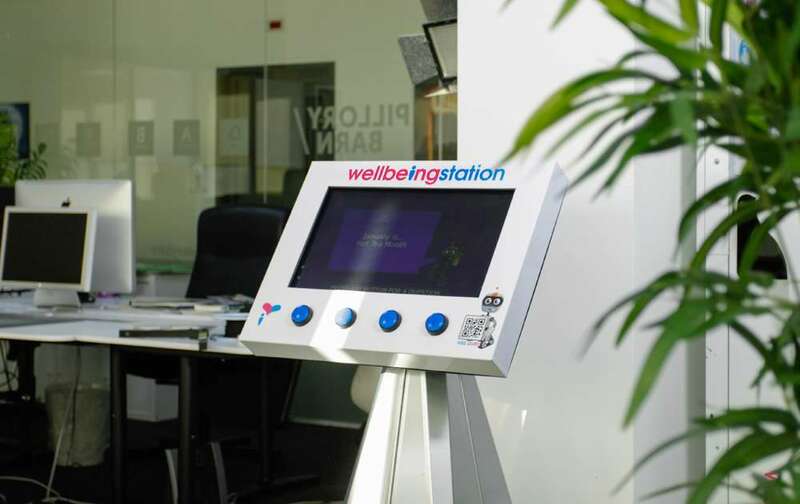 Generates wellbeing conversations promoting good health and wellbeing within the workplace. Call us today to organise a free 30 minute demo of the Wellbeing Guru at your workplace, school or organisation or book a demo for a full day for just £250! What is the Wellbeing Guru? The Wellbeing Guru is an easy to use, engaging and fun concept bringing wellbeing to life in the workplace every day. 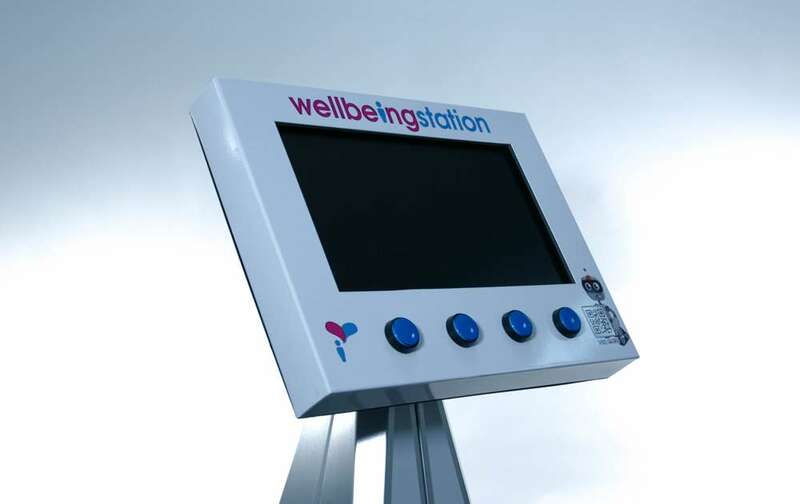 The Wellbeing Guru can be free standing or wall mounted and has been designed to be kept in any communal area, ideally where there will be the highest level of utilisation. Users answer five interesting health and wellbeing related quiz questions providing health and wellbeing knowledge, followed by facts, inspiring quotes and a wellbeing calendar of health and wellbeing awareness days and months. Through regular interaction with the Wellbeing Guru, individuals can get health and wellbeing reinforced messages which creates a basis for health and wellbeing to become a focal point within the workplace. This wellbeing interaction continues with the online Wellbeing Guru – providing users with a wide range of tools and further knowledge, helping to set and reach goals that takes the individual into an extended world of health and wellbeing support. Health Risk Assessment allows individuals to make nonmedical assessments about their health and wellbeing, and set challenges to improve their wellbeing based on their results. Life Balance Questionnaire (Boomerang) is a questionnaire is about the things you can’t throw away. It is essential that we recognise the effects of mental and physical health and put measures in place to support positive health and wellbeing choices. By using the Boomerang Life Balance, it helps individuals to understand the balance of their work and home life in order to reduce stress and feel happier. 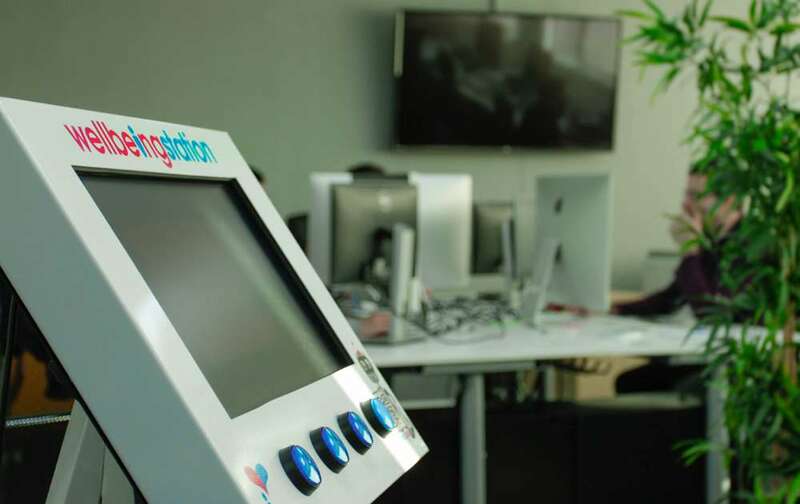 This will have a positive effect upon employees boosting productivity, satisfaction, and employee health and wellbeing. Quiz Questions – using the same basis as the Wellbeing Station, users can answer wellbeing related true or false quiz questions. MyMood is a mental resilience app that helps individuals to understand how they are feeling and why they might feel that way. Personal Challenges last for 4 weeks. You can select which goals fit your lifestyle to achieve your challenge, or you can add your own. Once started you can follow your progress and add your results from here. Health Library – Individuals have access to further support and information through being signposted to the relevant supporting bodies of the chosen topic. This is ideal for individuals who are concerned about any results of our employee health screening. 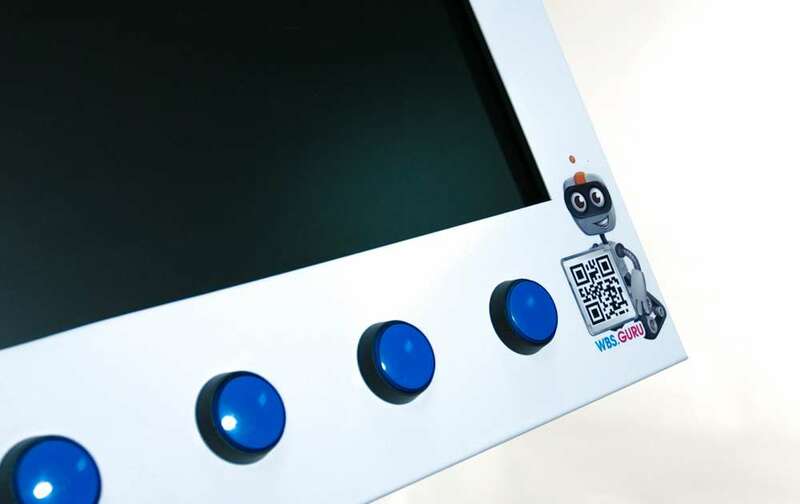 Through either scanning a QR code on the Wellbeing Guru’s display or following the ink provided, individuals can set up their own account with a username and password; their data and personal info will not be shared or identified. The online Wellbeing Guru also has the capability to automatically populate health metrics of the user that are taken from our Interactive Health Kiosk, and over time users can see graphs of progression. Designed to provide long-term engagement with over 6,000 questions, the Wellbeing Guru is fully prepared for individuals to interact over a three year period without having a repeat experience. The reason for this is that having a longer and sustained nudge towards health and wellbeing is a greater benefit to individuals than compared to shorter periods of exposure. National wellbeing awareness days/months, the Wellbeing Guru, when idle, will display thought provoking ‘quotes of the day’ that range from motivational and health and wellbeing related, through to fun facts and informative tips. This provides constant engagement with individuals creating relevant wellbeing conversations within the workplace. During idle mode, the Wellbeing Guru will display annual wellbeing calendar dates that include national awareness months and days, e.g. Dry January or Mental Health Awareness Day, encouraging individuals to become more aware of wellbeing events throughout the year and initiating positive interaction with friends and colleagues. Good employee wellbeing is not just an output but a method of organisational success. | Great wellbeing gives your organisation an edge, making employees happy to work. | Keeping employees happy helps to attract and retain the best talent in the market! | Prevention of poor mental and physical health is easier than finding a cure. | Reduced absenteeism means higher levels of performance and productivity.